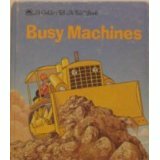 A fan of BUSY MACHINES just sent me a copy to sign and return. The original came out in 1985 and I hadn’t thought about it in quite a while. I checked it out on the Net and discovered that it still has a rating on Amazon where prices range from $2.95 – 68.00. On B&N I found one priced at $155. Where do they get these ridiculous prices? Someone told me that they may be computer driven. Anyway, there was my old book and now I have a copy here on the desk to sign to a baby who has not been born yet and who will live in the state of New York. Here’s a link if you’re interested. I’m charmed by the reader reviews. Someone came to me at the reception with a tattered copy of the same book, not much more than cover and bits and pieces of pages. and they’re ready for more! How do people set a steeple? Raist a tower in an hour? Lift the engine of a train? Set a farmer’s weather vane? Set a silo for the grain? It was a fun little book to write and I’m so glad that it lives on in the hearts of those who were little, too, when the book was new.